Only very specific circumstances saved the musical output of Gottfried Heinrich Stölzel from almost complete extinction. After spending some years in Italy, Stölzel was staying in Prague. When the post of Kapellmeister at the court of Schwarzburg-Sondershausen became vacant in 1715, he presented himself as a candidate for the job. But he didn't succeed: Prince Christian Wilhelm I elected Johann Balthasar Freislich, a decision which wasn't generally applauded by musicians and music lovers in Sondershausen. In 1718 Stölzel took the position of Kapellmeister at the court at Gera, and moved to Saxe-Gotha in 1720, where he held the same position until his death. In that same year Prince Günther I succeeded his father in Sondershausen. He was an intellectual and a great lover of music and the arts. As soon as he became acquainted with the compositions he very much regretted that Stölzel had not been appointed in 1715. As an alternative he asked him to compose a number of cycles of sacred cantatas, Passions and Te Deums as well as compositions for special occasions. Stölzel did so, but only after Freislich had given up his job as Kapellmeister to become the director of the opera at Danzig in 1731. It was mainly due to a strong admirer of Stölzel's in Sondershausen, Johann Christoph Rödiger, who was an alto singer and violinist at the court, and had sung as a treble under Stölzel in Gotha that Prince Günther got to know Stölzel's compositions. His cantatas were performed in the 1730s. He also copied most of Stölzel's compositions for performances at Sondershausen for about ten years. Stölzel had a great reputation as one of the most respected and admired composers of his time. In 1739 he was elected a member of Lorenz Christoph Mizler's Societät der Musikalischen Wissenschaften. Mizler even placed him above Johann Sebastian Bach in his list of leading German composers. Bach was among Stölzel's admirers, as the inclusion of the Partita in g minor in the Clavier-Büchlein vor Wilhelm Friedemann Bach shows. And it is very likely that Bach performed some of Stölzel's sacred cantatas in Leipzig. 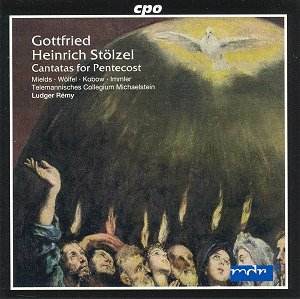 Listening to these cantatas it is easy to understand why Prince Günther regretted that Stölzel hadn't been appointed Kapellmeister in 1715. Their quality is exceptional, and fully supports the reputation Stölzel had in his time. Most of the cantatas begin with a four-part chorus, whose first section is predominantly homophonic, but which closes with a fugal section. It is remarkable that the third cantata here (Wollte Gott, dass alle das Volk weissagete) begins with a bass aria. But if one looks at the text, it makes sense, as here Moses is quoted (Numbers 11, 29) saying: "Would that all the Lord's people were prophets, that the Lord would put his spirit upon them!" The instrumentation is mostly strings, with oboes playing colla parte and basso continuo. In the first two cantatas they are joined by two horns. But in the cantata 'Lehre mich tun nach deinem Wohlgefallen' two flutes turn up. The text says: "Teach me to do your will, for you are my God; may your good Spirit guide me on the level path." Later on the idea of guidance is connected with the image of the shepherd; the cantata closes with a chorale which says: "The Lord is my good shepherd, keeps me under his guard." As flutes are often associated with pastoral subjects, their appearance in the opening chorus points to the subject matter of this cantata. As one would expect in sacred cantatas of the German baroque, there is plenty of text illustration. In the tenor aria 'Was saust so sanft' from the cantata "Werdet voll Geistes" the blowing of the Holy Spirit is illustrated by a motif of one short and one long note. There are descending motifs at the start of the bass aria from the third cantata on the words "If the Spirit falls on all" and in the soprano aria from the fifth cantata on the words "I throw myself at your feet". And when the soprano sings: "My spirit loses itself in thought" (Cantata no. 4) the first phrase ends with a general pause. In the tenor aria from the cantata 'Lehre mich tun nach deinem Wohlgefallen', the biting attacks of the orchestra eloquently illustrate the text: "You false guides of my life, world, Satan, fleshly ways!" The disc closes with a cantata which is written for Sunday Quasimodogeniti, the first Sunday after Easter. The opening chorus is a piece remarkable for its expression and rich harmony. The first phrase of this chorus shows a strong similarity with the instrumental introduction to the aria 'Comfort ye' from Handel's Messiah. Did Handel, who habitually borrowed from other composers, know this cantata? Having written the first treatise in German on recitative, Stölzel was considered an authority on the subject. These cantatas show that he was able to use his theoretical knowledge in an imaginative way. One of the features of his recitatives is the use of modulation. Often a recitative is directly followed by an accompagnato. In some of the recitatives two or more voices alternate. In one of his cantata cycles Stölzel even writes recitatives or accompagnati to be sung by all voices together. This happens in the cantata 'Er heisset Friedefürst' on this disc. Interestingly this wasn't generally appreciated in Sondershausen. The lexicographer Ernst Ludwig Gerber saw a connection between this style of composing and Stölzel's illness a couple of years before his death. However these cantatas were actually written in 1731. Outstanding music receiving very fine interpretations. In particular Dorothee Mields and Jan Kobow give excellent performances, and Christian Immler is also quite good, although perhaps a little less subtle than I would wish. I am not quite happy with Martin Wölfel. I find his voice a bit shrill and thin, and lacking warmth. He also uses a little too much vibrato. As these cantatas are performed with one voice per part, the four soloists also sing the tutti, and they do so very well. The orchestra is very enjoyable. The oboes give a special colouring to the sound of the strings. The parts for the transverse flutes and the horns are faultless, and there are some very vivid contributions from the bassoon. The booklet isn't to the usual standard. It seems a whole page has been left out as neither the last cantata (tracks 36 to 39) nor the names of the soloists are mentioned. To sum up: superior music with performances vary from good to outstanding, I strongly recommend this disc.